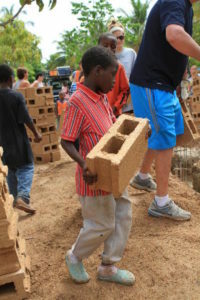 I have had the opportunity to make two trips to Haiti. The first trip was a family trip. In my mind I thought we were going to help the poor and change lives – we did help the poor, but the lives that were changed was ours. I could have never prepared my heart for what God had in store. As we crossed the border into Haiti that first day, the people looked so desperate for love. We were assigned to do construction in the Promised Land. We did everything from mixing concrete, digging ditches, picking up stones and hauling cinder blocks. One of the things that sticks out in my mind is on about the fourth day of working, we had a team of about four ladies hauling cinder blocks. I was so tired and felt like I couldn’t go anymore. I had let my body and mind give up. One of our team members gathered around us and prayed for God to give us strength to finish. I still did not feel revived until I looked up and saw about five little boys coming toward us with empty concrete bags on their heads. They were laughing and were so happy to help us. They wanted to carry the cinder blocks on their heads. God had sent Angels to help us carry those blocks. They would meet us half way and we would hand the blocks off to them. God spoke to me in a mighty way through Phillipians 4:13. “I can do all things thru Christ who strengthens me.” God sent me strength through those little boys. My second trip to the promise land was on a medical trip. It was just as amazing as the first. My family and I are hoping to return to Haiti July 2014.